Akira Hirokari was born in 1970 in Kobe, and graduated Tokyo University of Arts. Hirokari being a member of the Musa String Quartet won the first prize of Tokyo Contemporary Art Music Festival Competition, the First Asahi Contemporary Art Music Award, and Nippon Columbia Special Award. The Musa String Quartet was also awarded the second prize of Tokyo International Chamber Ensemble Competition, the Lufthansa Award. Hirokari assumed positions of the principal in Tokyo University of Arts Orchestra, Hiroshima Symphony Orchestra, Osaka Philharmonic Orchestra, and of Sapporo Symphony Orchestra, the position which he holds today. As a soloist, Hirokari performed with Hiroshima Symphony Orchestra and Sapporo Symphony Orchestra and appeared in Kiso Music Festival and Kurashiki Music Festival. He held solo recitals in 2004, visiting 3 cities and in May 2009 visited 2 cities, all well received. As a soloist for the Sapporo Symphony Orchestra Subscription Concerts, he played works of Japanese composers including Hikaru Hayashi and Toru Takemitsu. In 2005, he appeared as a soloist for Bartok’s Viola Concert and in May 2009 for R. Strauss’ “Don Quixote” all impressive. He is one of the outstanding violist today in Japan, with his rich and refined tone which sharply lead to the essence of the music. 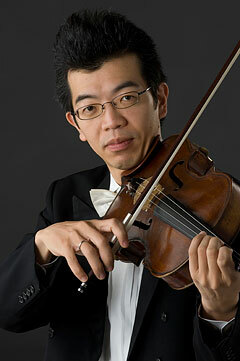 Hirokari studied violin under Reiji Takeuchi, Takako Murata, Takaya Urakawa, and viola under Takaya Urakawa, Toshiyuki Uzuka, Junji Suganuma, Nobuko Imai and Ulrich Koch. Hirokari is a part-time senior lecturer of Hokkaido University of Education, Iwamizawa Campus.